From creating custom audiences to targeting users by demographics, behavior, and interests– these are the essentials for finding your audience. When it comes to targeting a specific audience and/or market, there are few (if any) platforms more powerful than Facebook. Facebook offers serious potential for marketers and advertisers who want to reach a particular audience. This social media heavyweight boasts 68% of U.S. adults using their platform, with 51% of those users checking the site multiple times a day. Because Facebook also offers ways to target precise segments of their users at a relatively affordable price, it makes an ideal platform for many marketers and advertisers. But with so many options available, it can be tricky to make sure you’re reaching the right people. And since accurate targeting impacts ROI so significantly, you’ll want to get it right. If you’ve advertised on Facebook in the past with less-than-stellar results, keep reading as we explore practical ways to use Facebook’s targeting features to get your ads dialed into the right set of users. 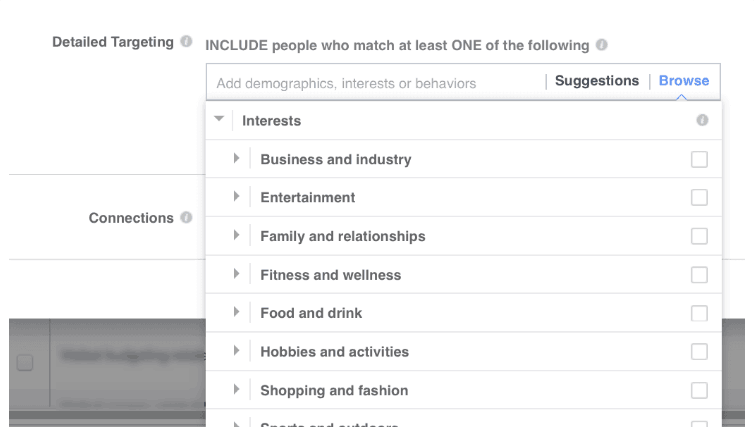 When creating a new custom audience, Facebook offers advertisers a range of targeting criteria. One of the most commonly-used filters is location. From whole countries all the way down to individual zip codes, this targeting feature allows you to display ads to users in precise geographic areas. Age, gender, and languages spoken are other broadstroke options you can use to further refine who sees your ads. Locations: Target ads to people based on locations (ex: country, state, province, city, congressional district, zip or post code). Most objectives let you target worldwide (type in “worldwide”), by region (ex: “Europe”), by free trade area (ex: “NAFTA”, the North American Free Trade Agreement) or by app store availability (ex: “iTunes app store countries”). Learn more. Gender: Target ads to women, men, or people of all genders. Custom Audiences: Custom Audiences are target audiences of people you already know created from information you provide or from information generated on Facebook’s products. 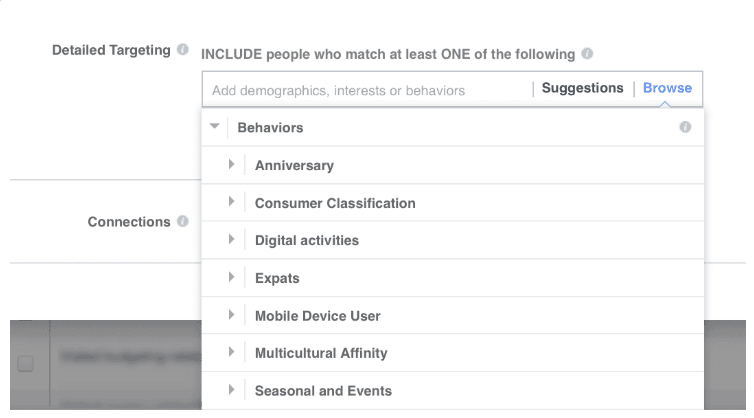 Facebook’s detailed targeting options include the ability to filter users by specific demographic data points or actions users take while on Facebook. Some examples include household income level, apps they use, pages they engage with, the types of ads they choose to click on, and their purchasing behaviors. The include/exclude feature makes its possible to serve up ads to an even more specific group of people. For example, if you were advertising high-end landscaping services, you could use this detailed targeting feature to include users who are in a specific geographic area and have an annual household income level between $100,00-$500,000. Using the exclude feature, you could remove users who don’t own a home. This fine-grained level of targeting ensures you’re only paying to serve ads to the people most likely to buy your product or service. 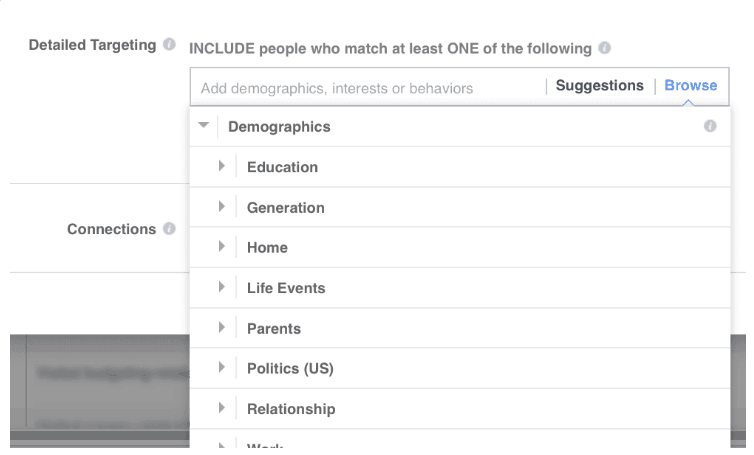 Digging deeper into the specific options using Facebook’s detailed targeting, you can target users based on demographics such as their level of education, relationship status, political affiliation, and more. You can also target users based on their interests, such as their hobbies, where they shop, family and relationships, entertainment (such as TV shows, bands, and other things they may like or engage with on Facebook), business and industry, and much more. 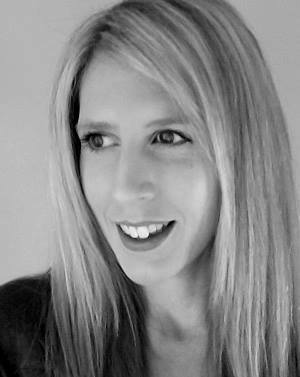 Targeting by behavior allows you to zero in on specific user data like purchase history, wedding and/or other anniversaries, and other digital activities that Facebook is able to track. The Saved Audience feature can boost your campaign creation productivity. A “saved audience” is simply a previous collection of targeting criteria you put together at a previous date using various targeting options. When serving up new ad sets, using a Saved Audience will prevent you from having to reinvent the wheel every time you create a campaign for this audience. Once you save a set of criteria as a Saved Audience, you’ll have the ability to choose this audience in your targeting options whenever you create a new campaign. 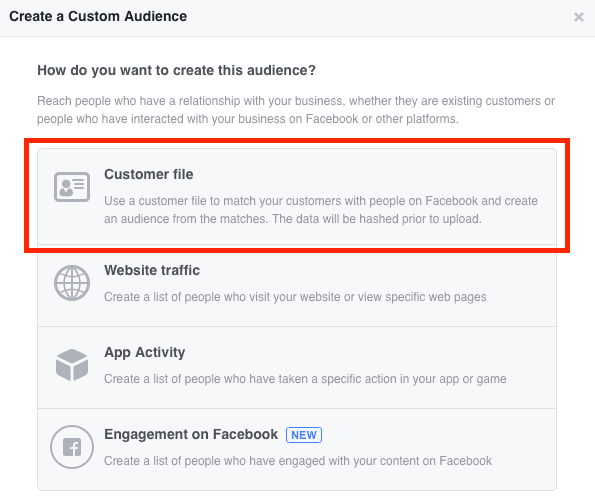 Facebook’s Custom Audiences is a powerful feature that pairs your existing customer contact information with user data from Facebook. To create a Custom Audience, you need to first provide Facebook with a list of your customers’ data, which can be imported from a spreadsheet, or “customer file”, containing customer email addresses or phone numbers. Many email marketing software services integrate right into Facebook’s Custom Audiences feature, making the process even easier. As seen through the menu above, you can also create a Custom Audience of your website traffic. By inserting a snippet of code onto your website, you can target only those visitors with your ads when they go on Facebook. The best thing about using the code snippet? You can get as specific as you’d like. For example, you can insert the code snippet on your pricing page, allowing you to serve specific ads only to website visitors that visited your pricing page, thus triggering the code snippet. This is one way to run more successful ad campaigns that span your entire marketing funnel rather than serving the same advertisement to a broader segment. If you’ve ever visited a website to research a purchase and were subsequently greeted with an ad for that same item on Facebook immediately afterward, you’ve been on the receiving end of Custom Audience targeting. Lookalike Audiences are one of the most effective tools that Facebook offers. To create one, Facebook analyzes an existing audience (such as visitors to your website or your Facebook business page followers) and then scours its database of users to create a larger list of people who closely match those in that existing audience. Once you choose the source for Facebook to base its lookalike off of, you can filter down further to target only lookalikes in specific countries. 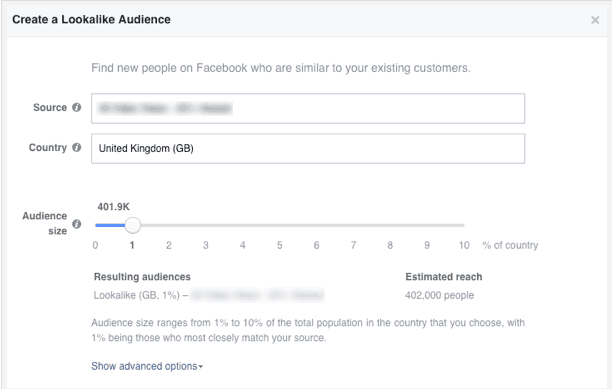 From there, you’ll notice an “audience size” gauge, wherein you can drag the marker to select the specific percentage of users from Facebook’s lookalike segment to target. Using a Lookalike Audience makes it possible to exponentially expand the reach of your advertising while maintaining a high level of targeting accuracy. Learning to use these tools can make the difference between a successful campaign and one that fizzles out. While you’ll still need to do some experimentation and testing, using the targeting options will prevent you from wasting cash in the process and will make it much more likely that your target audience will actually see your ads. The best way to know if your Facebook ad targeting is successful or not is by measuring the success and engagement of your campaigns. Grab this free Facebook Ads template and visualize all of your most important ad campaign KPIs in just minutes.